Devi (Chennai, India) on 26 April 2014 in Plant & Nature and Portfolio. The vendor next to the previous cart had these.After taking the shots the vendor demanded some money for tea.. I knew it was coming and had kept a few notes ready! !Thank God the model was a bunch of chillies !! Just imagine if it was a glamorous oomph female !!! I would have become a pauper!!! That's our kitchen we have a very common spice. For many kinds of food. They look so delicious! Lovely colours. Very nice composition, the market must be very colorful with all those spices. A great photo, I like a lot. @Gerard1948: Yes Gerard..Vegetable markets are always colourful!! Beautiful ! With a superb shine . Fortunately, my name is not Ainsley, today! but you have a pretty color model. like a lot of barnacles before being plucked from the sea! I love it! I can smell the flawor and taste the spicy!! Hot shot and fiery angle! This fine close up is worth what it cost! Fine capture of their look and rich color. These red chilies are really so beautiful! Great shot! This is real hot Red, Devi. A fine shot in this spicy series. Great point of view. Nicely done. 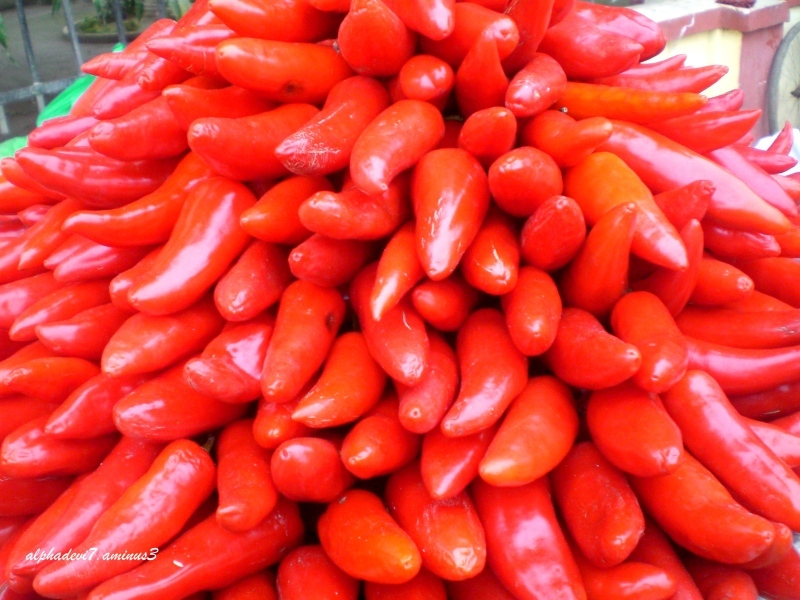 But it is a beautiful frame of these gorgeous peppers ---- well, worth it. --- Ever thought about a gorgeous male model, Devi !!!!!!!!! @Shiva: ha ha ha Monika.. Hmmm...may be long long ago..I had a crush on Rock Hudson...and then Superman...Gregory Peck...no models....I don't think you would have been born then !!! I do hope Ainsley will share! I love the vibrance of these ones. Delicious looking, but be sure to also taste great! :-)) Haleja. Have a nice weekend my good friend! Well done, love the color. @Shiva: Ah!! Yes ! Clark Gable...who can forget his Gone with the wind !!! Forgive me Devi, I didn't spot this one as I was away from the desk for a couple of days! I would certainly relish chomping in to one of these. I had Chili and Tomato soup today, my mouth is still on fire. Thank you for your kind donation.